Mixing art and animals can have questionable results. (Think "Dogs Playing Poker" or anything by Damien Hirst.) But sometimes the two come together to create something . . . magical? 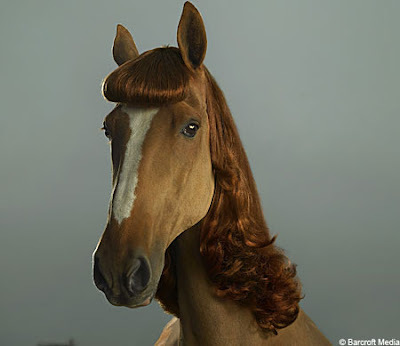 Take, for instance, artist Julian Wolkenstein's horsey supermodels (including the beauty shown above). Or the "extreme sheep LED art" in the video below. Urban Beasts are recycled skins of thrown out stuffed animals taxidermied to create feral relatives. Often displayed in community gardens, abandoned lots and in trees, an Anthology of their stories was developed to illustrate Humans' role as stewards of their environments. The sheepis one... WAS AMAZING!!! OoO I never knew that was possible!!! thats really cool how they turn old stuffed animals into other animals. and the sheeeps are so so so cute!!! to herd sheeps and make it into art is my dream job. How do those people have the patience to move those sheep like that???? I think the Mona Lisa was photoshopped though, but I think everything else was legit. Oh, LEDS are so much fun. I blew one, and it was...electrifying. It's like My Little Pony.. but worse. hey are there any boys online???? or is this just girls????? wow, yasmin i was just reading your profile and we have a lot in common. i also like slumdog millionaire ( own it) i love sense and sensibility, haven't seen the movie, i like x men and a lot of other there stuff like you. my favorite author is Kristen Miller, but my favorite classic author is Jane Austen! i own Persuasion, and Sense and Sensibility. hey have you seen Pride and Prejudice, the one from 2006 with Keira Knightley in it!!! best movie from that year!!! i can't wait to see X-men Origins!!!! Taxidermy has always greatly distubed me . . . that's why I avoid the entire downstairs of my house. Shudder. THE SHEEP ONE IS SOOOOOOOOOOOOOOOOOOOOOOOOOOOOOOO COOOOOOLLL!!!!!!!!!!!!!!! !